After a number of years absence, Dromore’s Leapoughs Pipe Band is reviving its once popular ‘Scotch Night Concert’, on Friday, March 4 from 8pm. The event will feature Ravara Pipe Band from Ballygowan, under Pipe Major Sam Connolly. One of Northern Ireland’s Grade One bands, Ravara competes successfully throughout the UK. Also on the programme is Hillsborough’s Drumlough Pipe Band, under Pipe Major Ian Burrows. Competing in Grade 3A, Drumlough has recently enjoyed a prizewinning resurgence. 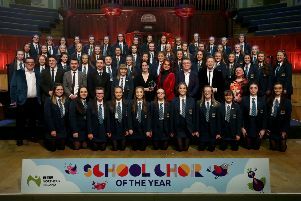 Dromore and District Male Voice Choir will take part, under conductor David Thompson and multi-instrumentalist Trevor Dickson will join them on the bill. The prominent and popular Skeogh Flute Band , under bandmaster Mark Cochrane, will likewise feature, alongside the renowned Baillies Mills Accordion Band, under Musical Director Aubrey Campbell. John Wallace, from WAringsford, will be compere for the night. Admission (£10 per adult) is payable at the door.